Wi-Fi security is always an issue for home users especially when they are not fully aware of its customization settings. These Wi-Fi connections are easily spread and shared in the neighborhood or suspicious people. Today, we will learn the different ways on how to check who is connected to your Wi-Fi on Mac. Read this article for us to learn who is connected to my Wi-Fi on Mac and find out how to secure and block unwanted connections. Maybe some of you may have accessed or already familiar with the steps on how to find and log in to your Wi-Fi’s router, just for a quick refresher, we will guide you on how to go inside your Wi-Fi settings step by step. The steps on how to find, access, and login to your Wi-Fi router is the same in all Mac OS X versions even both on wireless and with Ethernet routers. New versions of Mac OS X included Wi-Fi details and display it anywhere on Mac. Simply hold down the Option key and then click on the Wi-Fi menu icon found on the top corner of your Mac. Here you can find the detailed information regarding your Wi-Fi connectivity including the router address. Most router devices have included their router IP address found at the back of the device usually with the default username and password. Once you got the IP address, default admin username and password (from your Wireless network provider) you can now try logging in to check who is connected to your Wi-Fi or how many devices are connected to your router. Part 2. How to Check Your Wi-Fi Connections on Mac? To ensure that you are getting the best possible Wi-Fi signal at home or in your area, you can run diagnostics to see and monitor who and what devices connect to your Wi-Fi. Under the Summary, you can find two channels 2.4 and 5GHz. Both will show total number of users connected. Choose the channel which suits your device. 2.4GHz is best for getting through or penetrating walls however this channel is easily or can be easily intercepted while the 5GHz has a more stable connection but with lesser penetration. If you have been connected to several wireless networks and you want to manage these connections, you can do so by using FoneDog PowerMyMac. This powerful software contains all the needed tools to optimize, cleanup, and troubleshoot Mac. Through its Wi-Fi Analysis toolkit, you will be able to check your Wi-Fi details, including the username password. 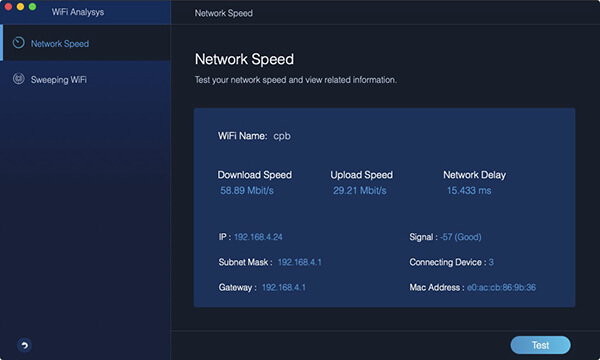 You can also monitor and test the online speed plus you can view all the wireless connections your device connected to. You can also see the list of wireless networks you had connected with along with the username and passwords. You can easily turn on and off this setting when you want to automatically connect to these available networks. Now you don’t have to worry about getting these details when you are around these networks. Are you having trouble with your Wi-Fi signal? Slow internet can be caused by many contributing factors. Most of which are poor signal connection, browser clutters (saved cache and data), and even cluttered system. If you are searching for ways to improve and speed up your wireless connection, here are the tips you should try! Check to see if you are getting the right speed based on what you have subscribed for. First, check your data plan by visiting your provider’s website. Next is to go to a speed test site to check your speed. One of the popular sites there is Speedtest.net where it gives you speed test results real time. Most of us are guilty of having multiple tabs while browsing and tend to leave these tabs open for so long. This practice causes slowness too because it takes a longer time for the browser to process your request since it has to handle the current tabs you have plus the new ones you are searching. Apart from that, there are apps we tend to open in the background but do not really use. To avoid latency, try to close and use only a few tabs and manage your usage accordingly. 17 Reasons Why Your Mac Running Slow! How Do You Speed Up Your Mac? A quick router reboot will also help in speeding up your connection. Simply turn off the router for a few seconds and then turn it back on. Once you have finished restarting the router, you can try and test your internet speed. Turning your Mac into a hotspot is possible as long as your device runs on OS X 10.6 and later. You can practically enjoy internet sharing with friends by simply enabling it. Tick the option box beside Internet Sharing and then tick the box for the Wi-Fi too. After enabling this setting, you can now enjoy internet sharing with friends. There are plenty of options in checking your Wi-Fi connections. It all depends on how and what you prefer to do. Through this article, you will no longer ask “Who is connected to my Wi-Fi on Mac” but rather share this post with your friends so they too can maximize and manage their wireless connections. How to Flush DNS Cache on You Mac?